Skin and pH. Is pH Balanced Important? When it comes to your skin and pH, just how important is it? 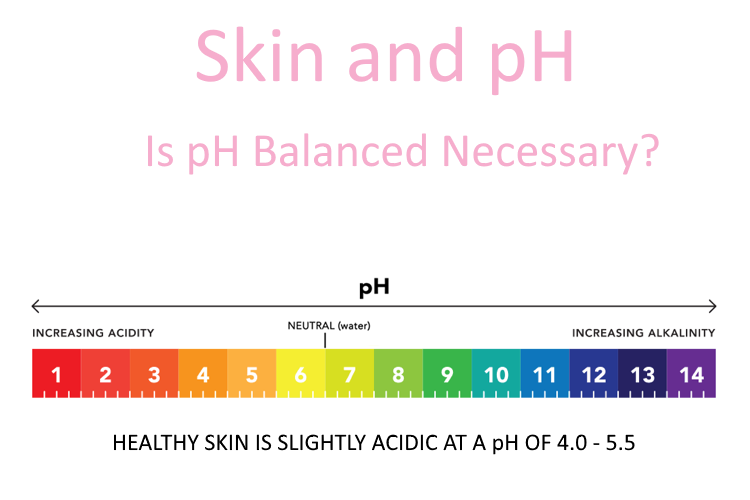 Your skin pH is a measurement of how acidic or alkalinic it is and companies may use the term “pH balanced”, to describe products that will keep skin at an optimal pH level. Before we get into the nitty gritty about skin and pH, let’s first discuss what pH means. pH is short for ‘potential to free hydrogen ions’ and is a measurement of the acidity or alkalinity of a solution. pH values range between 0 and 14, with values at either end being quite extreme and potentially dangerous, leading to chemical burns, for example. A pH of 7.0 is considered neutral. Anything below 7 is considered acidic and anything above 7.0, alkaline. Our skin’s surface (stratum corneum) is covered by a thin, protective layer called the acid mantle, which contains free fatty acids (sebum), mixed with lactic and amino acids from sweat to create the skin’s pH, which is slightly acidic and sits around 4.5 – 5.5. Acidity helps to inhibit the growth of harmful bacteria and also helps to activate certain enzymes in the stratum corneum. Lifestyle factors, the environment (sun, air, pollution), water and cosmetics can all interfere with the delicate nature of the skin and pH balance and can contribute to a breakdown of the protective acid mantle, leaving the skin vulnerable to damage. An impaired acid mantle makes it harder for the skin to stay hydrated and for it to repair itself. Highly alkaline products (like some cleansers) strip away natural oils leading to dryness and irritation and contributing to eczema, psoriasis and rosacea. Skin that is too alkaline can also become more susceptible to acne because a certain level of acidity is needed to inhibit bacterial growth on the skin. Sodium laureth sulfate (SLS), a widely used surfactant (cleaning agent), has a pH of approximately 10 and can lead to dryness and irritation. For this reason, many companies, including Apothekari, no longer use SLS in their formulations and have opted for milder agents such as Sodium Methyl Cocoyl Taurate , Sodium C14-16 Olefin Sulfonate or Sodium Cocoamphoacetate amongst others. At the opposite side of the spectrum, overly acidic products may be problematic as well. Just like overly alkaline treatments, they too can strip away skin’s natural oils, disrupting the skin’s lipid barrier. Alpha hydroxy acids (AHAs), retinoids and beta hydroxy acids can weaken the skin’s natural defenses if they aren’t used properly. While these treatments offer many benefits to skin, it’s important to exercise caution when using them. Start off gradually and don’t combine too many acidic treatments in one session. If your skin experiences redness or dryness, if it becomes more sensitive, or if you notice an increase in breakouts, it’s an indication that the product is too strong for your skin, or you may be applying it too often. What’s important when it comes to your skin and pH is to ensure that you incorporate products that respect this balance. Effective moisturizers can help to replenish the acid mantle to keep it intact. Antioxidants, including vitamins A, C, E, and green tea are important in maintaining the acid mantle by protecting cells from environmental stresses and oxidation. Daily sunscreen (have you tried our Shade SPF 30?) use defends the acid mantle from sun damage and increases the skin’s ability to protect itself. Bear in mind as well, that most of us have skin that is pretty resilient! Our skin is able to readjust its pH after exposure to topical products, but most of us should avoid strongly alkaline soaps and cleansers because they tend to strip away protective natural oils. Sensitive skinned individuals, babies and the elderly may struggle a bit more and for this reason, they should avoid products that are too acidic or alkalinic as it may lead to dryness and irritation. As discussed above, most companies are aware of this and their products are pH balanced, even if they don’t specifically state it. There’s really no need to pay more for ‘pH balanced’ skin care – it’s often just a marketing ploy.